What if I told you losing your muffin top can be done from the comfort of your own home? If you do these simple exercises and eat properly, the fat around your hips will melt off at a surprisingly fast rate. For most women, they are often the “last thing to go” when trying to lose weight. But when you do the proper exercises and add certain foods to your diet, you won’t have to wait as long as you think to see results. Also, be sure to check out our article on how to lose thigh fat. Lay on your mat on your back with your knees raised above your body with your knees bent and parallel to the floor, while your arms are extended straight above you. Activate your core muscles while you then straight out your right foot and simultaneously lower your left straight arm towards the ground, staying parallel. Repeat by alternating sides. You’ll know you’re doing it right by feeling the burn in your abdominals after just a few reps! On your back again, bend your knees into your chest with your hands behind your head, or resting your fingers on your temples to avoid straining your neck. Bend your left knee into your chest as your right leg extends forward, nearly parallel to the floor as your right shoulder turns into your knee, crunching your shoulder and knee closer together. Alternate feet and arms per rep.
Assemble yourself into a forearm plank position, squeezing your abs tight and lifting your hips slightly above your shoulders. Rotate your right hip towards the floor, turning your feet onto their sides. Lift your hips lifting back to starting position. If you want to go for an extra balance challenge, lift your arm opposite to the one you are planking with into the air, and if you are feeling even braver, lift up that top foot and hold in the air. Lay on your belly with your arms and legs extended above you and behind you. Inhale to grow your spine and lift your chest, arms and thighs off of the floor, pushing energy through your heels and finger tips, hovering above the mat. Look towards the ground to keep your neck from straining. Rest down towards the mat, and repeat this action for desired repetition count. Start slowly and work your way up to more reps. Say goodbye to those muffin tops and hello to feeling and looking amazing. 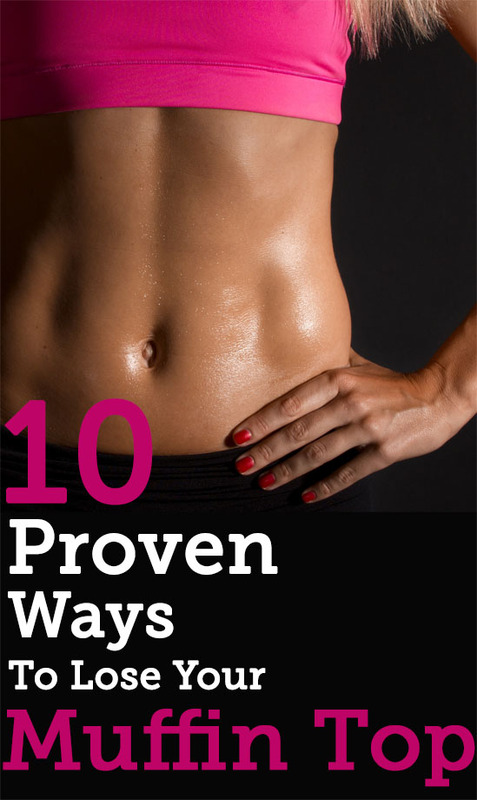 Now it's time to really start working on your abs. Hate hitting the gym? Check out these easy at-home exercises that chase your muffin tops away. Be sure to prioritize your form over anything else when performing fat-killing workouts.